Redemption Research for Health and Educational Development Society (RRHEDS) was established in the year 2003 by Mr Pulipati Kennedy. It is based in Andhra Pradesh and strives towards empowerment of deprived and vulnerable sections of Society. The target community comprises agricultural labourers, fishermen, tribal and other socio economically backward groups. RRHEDS covers around 139 villages in Prakasam, Guntur, Nellore, Chittor, Visakhapatnam, Vizayanagaram, and Ranga Reddy districts of Andhra Pradesh. RRHEDS organises health and educational programmes and distributes free medicines, tooth brushes and toothpastes, and educational material such as slates, books, pencils and so on. The NGO organises awareness camps for water sanitation, HIV/AIDS, Youth Welfare, environment protection and watershed management. It also organises training camps for vocational training to women and formation of SHGs. RRHEDS aims to build strategic partnerships with the Government, NGOs, SHGs, CBOs and various national and international organisations to achieve its objectives. Corporate Sources: Dabur India Ltd, a large domestic FMCG company, funded 90% (Rs4mn) of RRHEDS’ total income in FY13. RRHEDS managed to source funds to the tune of Rs10mn from Dabur in FY12. Though funds decreased by Rs6mn YoY in FY13, the NGO feels assured of continued assistance from Dabur in future. 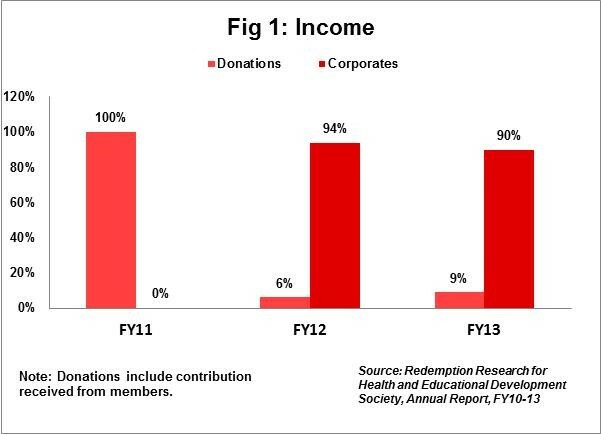 General Donations: In FY13, 9% (Rs0.4mn) of total income was through donations. Contributions received from members include proceeds from sale of paddy cultivations and membership fees and forms part of donations. (Refer Fig. 1). Total expenses: Expenses aggregated Rs5.2mn in FY13, with 98% (Rs4.9mn) of total expenses incurred on core programme activities including programme salaries (sector average of programme expenses: 88%). 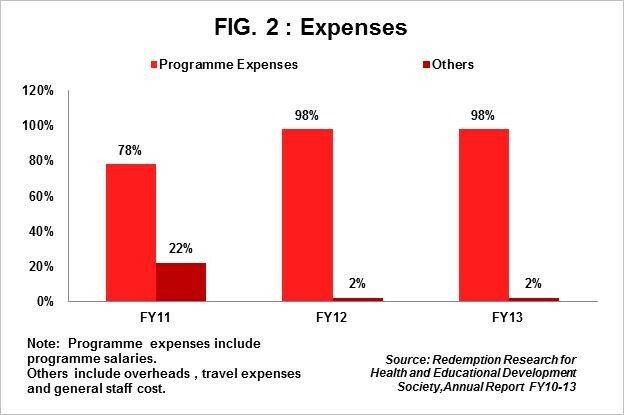 Programme expenses have been in the range of 78% to 98% during FY11-FY13. Overheads: RRHEDS spends a marginal amount on overheads. In FY13, overheads accounted for 1% (Rs32,329) of total expenses. Lower spending on overheads indicates optimum utilisation of funds for programme activities. (Refer Fig. 2). Fixed Assets: Fixed assets comprised of furniture and computers and accounted for 92% (Rs0.16mn) of total assets in FY13. The assets increased from Rs19,650 in FY12 to Rs0.16mn in FY13 on account of purchase of additional computers. Trust Corpus: RRHEDS has set aside a small proportion of its funds as corpus. Corpus accounted for 2% (Rs3,500) of total funds in FY13. General Funds: The minimal surplus witnessed Y-o-Y during FY11-FY13 has led to the marginal increase in general funds from Rs0.178mn in FY12 to Rs0.179mn in FY13. Income Growth: RRHEDS witnessed a negative income growth of 52% in FY13 as against an income growth of 1,681% in FY12. The big jump in FY12 income was due to significant rise in total income from Rs0.6mn in FY11 to Rs10mn in FY12 on account of funding from Dabur. Further, total income declined in FY13 as a result of decline in funds from Dabur by around 53% (Rs4mn in FY13 Vs Rs10mn in FY12). RRHEDS witnessed income CAGR of 192% during FY11-FY13. Self Sufficiency Ratio: The ratio measures the ability of an organisation to meet expenses from its own funds. Own funds constitute donations and account for 9% of total income. Hence, the self-sufficiency ratio is 9%. Funds Utilisation Ratio: The ratio indicates the ability of an organisation to effectively utilise the funds received. The ratio is 99% indicating effective utilisation of funds for programme activities by RRHEDS. Dependency: RRHEDS largely depends on corporate funding from Dabur. As is evident from the income trend, changes in funding receipts from Dabur led to income volatility in FY12 and FY13. Lack of infrastructure: RRHEDS carries on work in the remote areas of Andhra Pradesh where the major concern is arranging for basic necessities such as school benches, uniforms, computers and sanitation facilities. Inadequate availability of donations in kind is an issue. Listing with accrediting agencies: RRHEDS has applied for getting listed with reputed accrediting agencies. However, inspite of repetitive follow ups, the NGO has not been successful in getting any kind of response from the agencies. The members of the Board are from social background and actively participate in programmes conducted by RRHEDS. These programmes are conducted in collaboration with Government agencies. The Board meets once in a year or as and when required. The activities of RRHEDS have been published in regional papers of Andhra Pradesh.